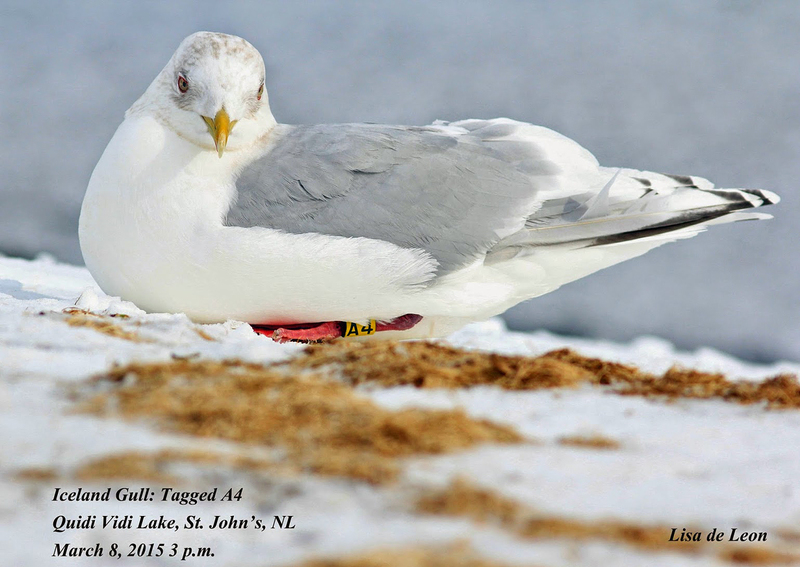 Iceland Gull (kumlieni) A4 adult, January 2013 - March 2015, Quidi Vidi Lake, St. John's, Newfoundland. Picture: Lisa de Leon, Peter Adriaens & Alvan Buckley. Yellow A4 and Fed band no 0846-53647, banded in winter on November 23 2011, in St. John's, Newfoundland (LAT: 47.80833; LON: -52.80833). Hatched "in 2010 or earlier". Age adult winter, lacking brown wash on primary coverts. Wingtip darkness score: 2.5 - medium-dark grey (Estimated Kodak 11-13). In the study by Howell & Mactavish, about 5% of Kumlien's Gulls in New Foundland belong to this category, see Table 1. 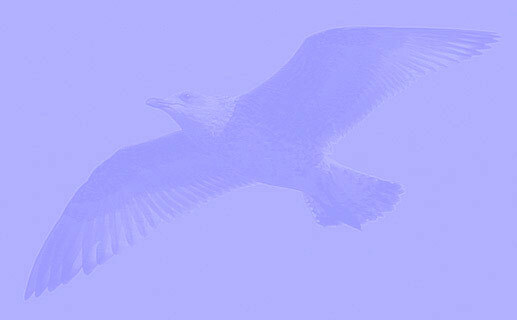 Wingtip scoring for dark markings on P5-P10: 0-3-4-4-4-1. See Plate 1 for explanation. Wingtip pattern category: Type M, Stage 4 (55%), darker grey or more extensive grey marks on the outer five primaries with complete subterminal bands on zero to three primaries. See primary patterns for explanation. 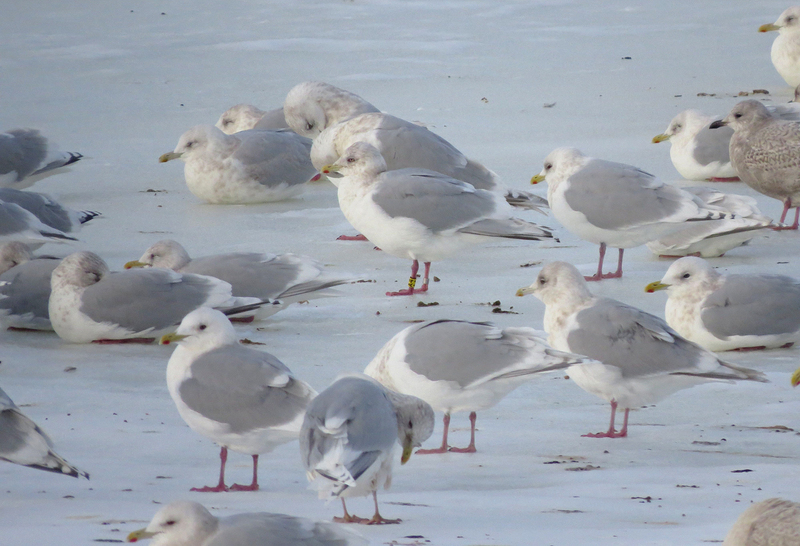 In the study by Howell & Mactavish, about 11% of Kumlien's Gulls in New Foundland belong to this category, see Table 2.
below: Iceland Gull (kumlieni) adult A4 January 23 2013, Quidi Vidi Lake, St. John's, Newfoundland. Picture: Peter Adriaens. below: Iceland Gull (kumlieni) A4 adult, December 31 2013, Quidi Vidi Lake, St. John's, Newfoundland. Picture: Alvan Buckley. below: Iceland Gull (kumlieni) A4 adult, March 08 2015, Quidi Vidi Lake, St. John's, Newfoundland. Picture: Lisa de Leon. Pale iris. Again showing dark grey primary pigmentation.